In a distinguished career of public service of 20 years, Raphael Baku served as a Deputy Inspector General of Government of the Republic of Uganda between 2005-2013 for 8 years and also as an Acting Inspector General from 2009-2012, appointed by the President. Raphael was responsible for a broad range of functions, providing leadership to promote and foster strict adherence to the rule of law by implementing effective enforcement of the Leadership Code of Conduct; conducting investigations of complaints of corruption and authorizing prosecutions where a corruption offense has been established and stimulate public awareness on good governance and constitutionalism. Raphael represented the IG at national, regional and international meetings, conferences and seminars which led him to be elected to serve as the President of the East-African Association of Anti-corruption authorities. Prior to that, from 1996-2001, Raphael served as a Member of Parliament representing the West Moyo Constituency. Raphael has a law degree and an LLM from the Makerere University in Kampala and brings enormous experience and insight into the running of integrity institutions within the African context and is a recognized leader in the field. The general function of my appointment was to provide technical assistance to South Sudan Anti-corruption Commission. Accordingly my duties were to provide policy and technical guidance to the Commission; support the Commission in its capacity building programs, such as training and equipping the Commission with appropriate tools for the performance of its functions; support development of a Strategic Plan for the Commission; support review of the National Anti-corruption Strategy; and to generally support the Commission in the discharge of its functions. The duties were to perform the functions of the Inspectorate of Government , the lead anti corruption agency and national Ombudsman institution in the Republic of Uganda which are: a)To promote and foster strict adherence to the rule of law and principles of good governance in administration, b) To eliminate and foster the elimination of corruption ,abuse of authority and public office, c)To promote fair, efficient and good governance in public offices, d)To enforce the Leadership Code of Conduct, e) To investigate any act, omission, advice, decision, or recommendation by a public officer or any other authority to which the law applies, taken , made, given or done in exercise of administrative functions and f) To stimulate public awareness. The duties were a) To discharge the functions of the Inspectorate of Government as stated above for Deputy Inspector General of Government, b) Provide leadership to the institution, c) Authorise investigations of complaints of corruption , breaches of the leadership code of conduct and maladministration d) Supervising the investigations, e) Authorising prosecution where a corruption offence has been established f) Issuing reports for administrative sanctions where misconduct falling short of criminality is established. Providing leadership for the Directorate of Legal Affairs after the substantive Director was appointed a Judge of the High Court of Uganda. 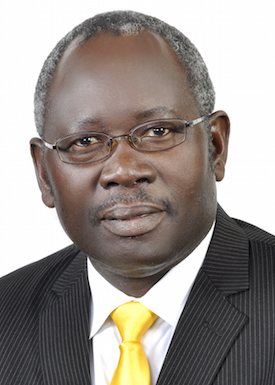 1996 – 2001: Member of Parliament of the Republic of Uganda , West Moyo Constituency. Served on the Defense and Internal Affairs Committee; and the Committee on Rules, Privileges and Discipline of Parliament .